APA is actively engaging members to identify the needs and priorities of and provide resources to planners who are focused on water issues in their communities. New Orleans served as an ideal venue to talk about water, as planners from across the country convened at the 2018 National Planning Conference in New Orleans in April. The city is located at the epicenter of water infrastructure and resilience planning. In 2013, New Orleans released the Greater New Orleans Urban Water Plan, which addresses groundwater and stormwater as critical factors in shaping a safer, more livable, and economically vibrant Southeast Louisiana and provides a notable example of the One Water approach. APA’s Water and Planning Network on LinkedIn operates as communications and information sharing network to connect members to the best planning practices that reflect current research, science, policy, and technology regarding the protection, management, and use of water resources and utilities. NPC18 attendees learned about the relationship between water resource management and planning and One Water at a number of conference events: Planning for Water, Water Decision-Support Tools for Planners, Linking Water and Land-Use Planning, and Water- and Land-Use Planning Relationships, Comprehensive Planning and Green Stormwater Infrastructure, and Tackling Barriers to Green Infrastructure. These sessions provided an overview of planning and management practices, inter-organizational cooperation, state legislation related to water and land use management, and recent (industry and academic) research efforts. They demonstrated actual procedures, facilities, and techniques pertaining to integrated water resources management. The Water and Planning Network met at the end of the second day of the 2018 National Planning Conference. Photo by Anna Read. The Water and Planning Network, which launched at NPC17 in New York, convened for a meeting/social gathering on Sunday evening. 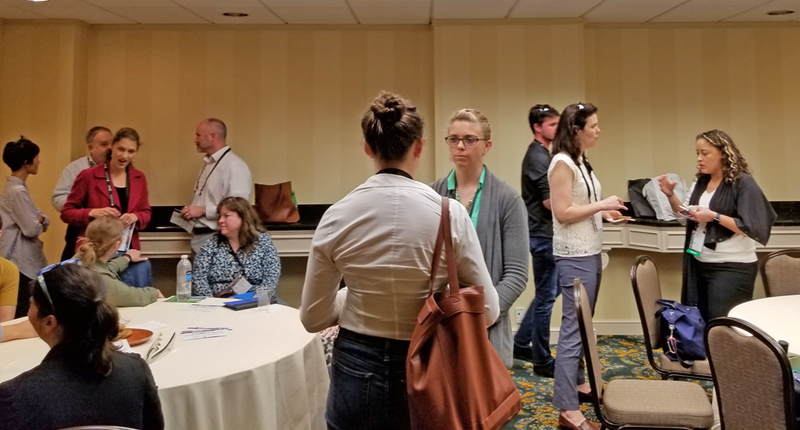 The meeting provided an opportunity to learn about APA's research and initiatives on One Water, and for networking with water and planning professionals. APA will be hosting Water and Planning Connect, a two-day conference focused on the relationships between land-use planning and water resources management, in Kansas City, September 11–12, 2018. Join planners, water utility professionals, and other affiliated professionals to learn about and discuss water issues of common concern. Top image: An aerial view of the Seabrook Floodgate Complex in Louisiana under construction in October 2011. Photo by U.S. Army Corps of Engineers (CC BY 2.0). Gulafshan Ghori is a program development and research intern with APA.